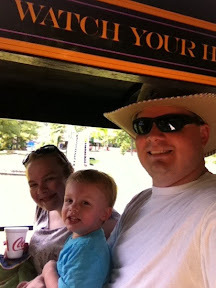 Ok, so it isn't Saturday, but yesterday we went to the park...Camden Park! 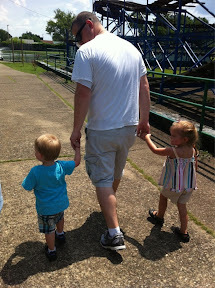 Tyler, Tristan and I met Tim, Brittany and Addi at Camden Park for a day of big kid fun. Tim's cousin Jason and his son Jackson just so happened to come on the same day. It was a blast! We walked in and headed straight to Kiddie Land. 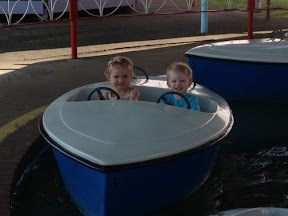 First they rode the boats. Then we headed to the Little Whip. Let me just say this alone was worth the price of admission! Tristan squealed and giggled every time the whipped around the curve. 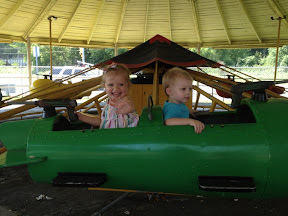 They rode the little cars and then the fighter planes. Tristan made a mean face a said, "Boom, boom, boom!" as he shot his gun. 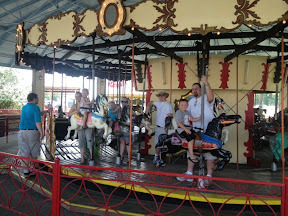 We headed to the carousel. 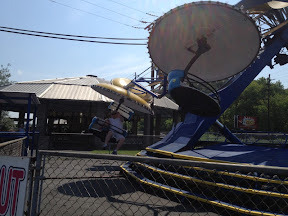 Then, Tyler and Tristan rode the Paratrooper. 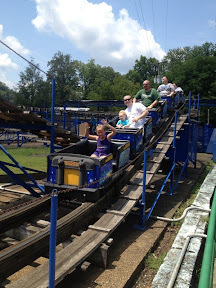 We weren't sure how Tristan would react because it is fast, high and drops, but he loved it! 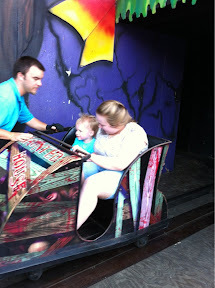 Next, Addi wanted to ride the haunted house. Tristan, of course, wanted to do whatever she was doing. I told to bury his eyes on Momma if he got scared and it would be over soon. I asked him if it was scary and he said, "A little bit," haha! Then we rode a different car ride before heading to the train. Tristan loves trains and we all could ride at the same time, not to mention by then it was getting hot so we needed a little break. 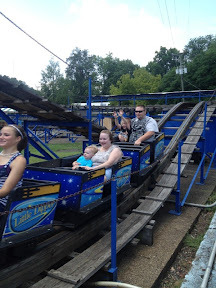 Next, Tristan wanted to ride the Little Dipper. It's a roller coaster! I wasn't sure what to think when we got on and he didn't seem to like it much. 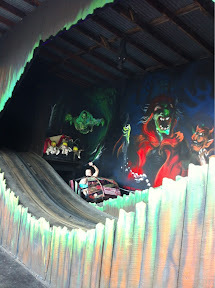 When the ride ended he had a mean look on his face. I said, "Didn't you like it?" 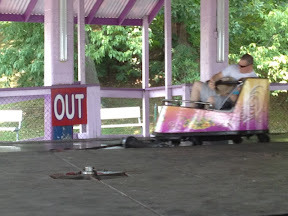 To which he answered, "I want to ride it again!" He whined until we said yes! This time he rode with his Daddy. 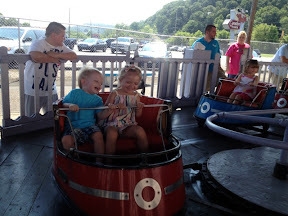 Tyler insisted on riding the Tilt-a-Whirl. 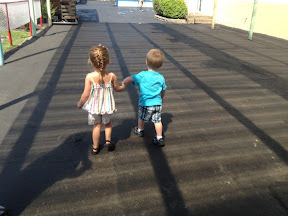 Addi chickened out at the last minute and Tristan wished he had. He got 3/4 of the way through the ride, but hit a particularly hard spin and wanted off. He fussed, but no actual crying and no meltdown. We couldn't pass the pony carts without a ride, complete with Tristan singing the old song, "Pony Boy" that my Mom taught him. 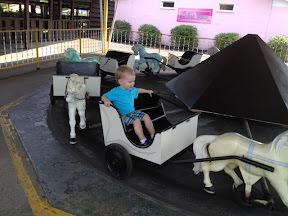 After that, Tristan rode The Whip (the big one) with Tyler. We hit the little planes, the Little Whip and the boats again before calling it a day. This all only took 2 hours...no lines! 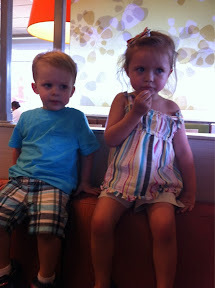 We went to McDonald's for lunch before heading home. 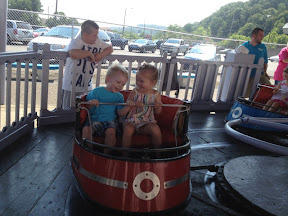 Tristan: I had a lot of fun at Camden Park.